The metazoan meiofauna associated with Lophelia pertusa reef degradation zones in the Belgica Mound province (Porcupine Seabight, North-East Atlantic) was studied in the framework of the Atlantic Coral Ecosystem Study (ACES; EC Fifth Framework Research Program). Attention was focused on the influence of and differences between different microhabitat types: dead coral fragments, glass sponge skeletons and the underlying sediment. This study demonstrates the importance of dead Lophelia pertusa framework and associated substrates for meiofauna along the European continental margins. The presence of these large biogenic structures on the seafloor of the continental margin (1) enables more taxa to be present and (2) particularly favours harpacticoid copepods, naupliar larvae and polychaetes. The meio-epifaunal community on these substrates significantly differs from the meio-infaunal community in the underlying sediment. This is mainly due to a much lower dominance of nematodes and a higher relative abundance of most other taxa, especially harpacticoids, naupliar larvae and polychaetes, in the latter habitat. This situation is comparable to that of epiphytic assemblages. Dominance of nematodes is low. The meio-infaunal assemblage in the underlying sediment is characterized by low densities. 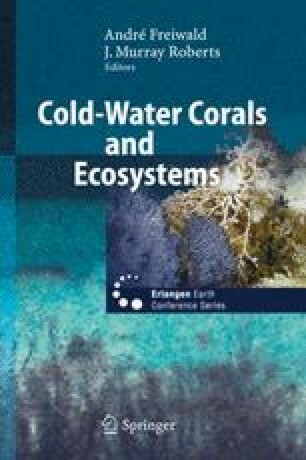 There are clear indications that cold-water coral degradation zones are biologically very diverse, in terms of species richness as well as equitability. Of all microhabitat types, coral fragments support the most diverse communities, whereas the underlying sediment is the least diverse.